Some months we wrote about the album “Swedish Hitz Goes Metal”, which was released in May 2011 and includes metal covers of the biggest hits written by ABBA, Roxette and Ace Of Base. We received an email from Niclas Eliasson with the link to their newly released video to “The Look”. You can read more about the band and the album in this Facebook page. Tommy ReinXeed, singer from the North of Sweden, is now revealing “SWEDISH HITZ GOES METAL” album. Tommy ReinXeed has already released 4 studio albums with his own band ReinXeed in Japan and Europe, but he also has a huge passion to do hard rock/metal versions of his favorite songs. 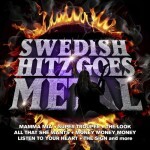 With the album “Swedish Hitz Goes Metal” we get the biggest hits written by ABBA, Roxette and Ace Of Base. The album is released in Sweden (Naxos Sweden) and Japan (King Records) in May 2011. “Money Money Money” (ABBA) is the first single and the first video. The 2nd video will be Roxette’s “The Look” featuring the Norwegian talented singer “PelleK”. More info to be found at Facebook page. Thanks to Michal Wroclaw of RoxettePL Facebook page.